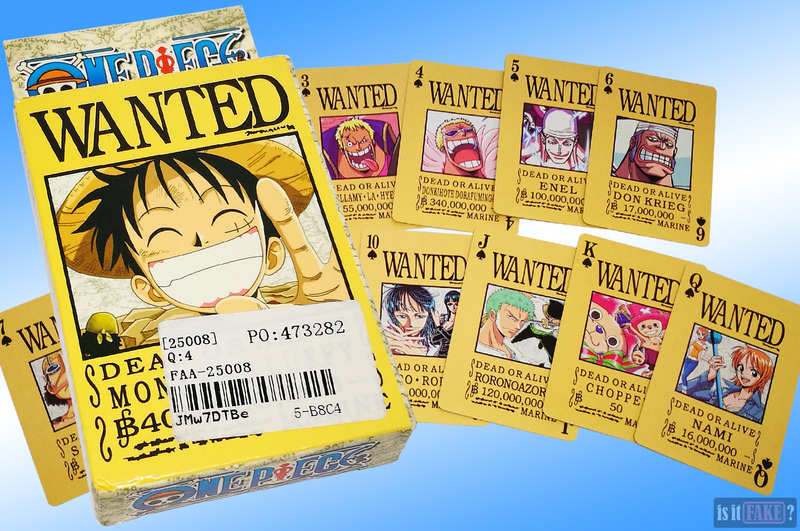 The Straw Hat Pirates of One Piece are an iconic bunch, so much so that stamping their faces on any product would almost guarantee instant profit. It doesn’t matter what that product is – it could be a mug, a t-shirt, or even a deck of cards, and it would still sell like hotcakes. 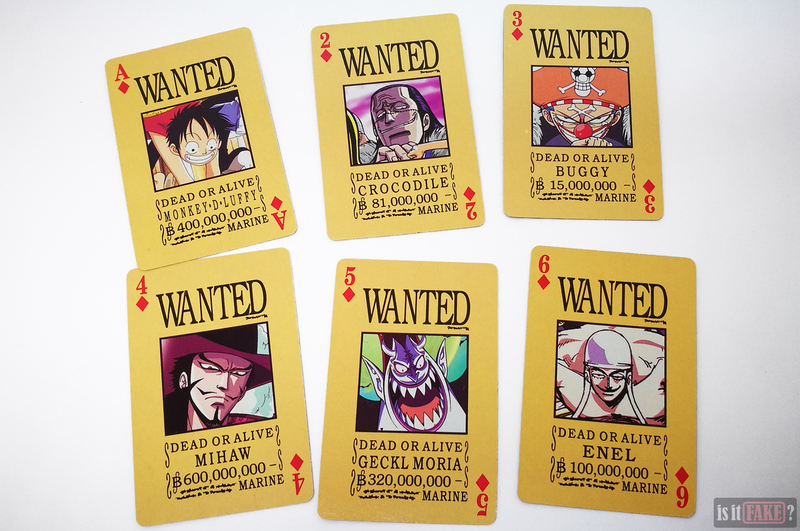 It’s no surprise, then, that some enterprising bootleggers came up with the idea of creating these fake One Piece poker cards. But a great idea doesn’t a great product make; it all depends on the effort, resources, technology, and care that’s put into the manufacture of said item. And since bootleggers are only concerned with one thing (i.e. their own profit), to expect quality from a fake will only lead to disappointment. The internet is home to countless lawbreakers eager to sell you their illicit goods, many of which end up in online shops. Here, equally deceitful sellers hawk such products to consumers who don’t know any better. 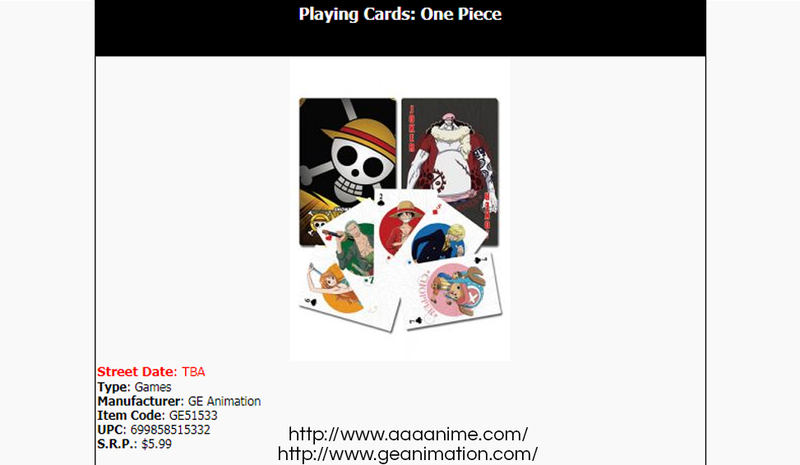 Tinydeal is a good example of such an online store, and it is here we purchased this deck of fake One Piece poker cards. Looking at this product’s packaging, you might be convinced it was produced by Movic, a licensed Japanese manufacturer of anime products. Unfortunately, this isn’t the case. For one thing, there’s no evidence Movic ever created such a deck of cards. Secondly, these cards are infested with questionable characteristics, making it highly doubtful a company recognized for high-quality products were ever responsible for them. 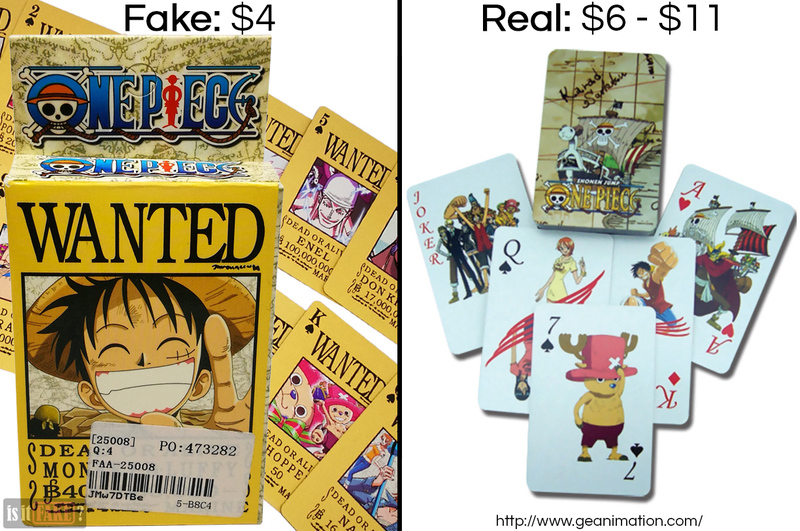 The fake One Piece poker cards are packaged in a cardboard box that is adorned with official images from the anime. 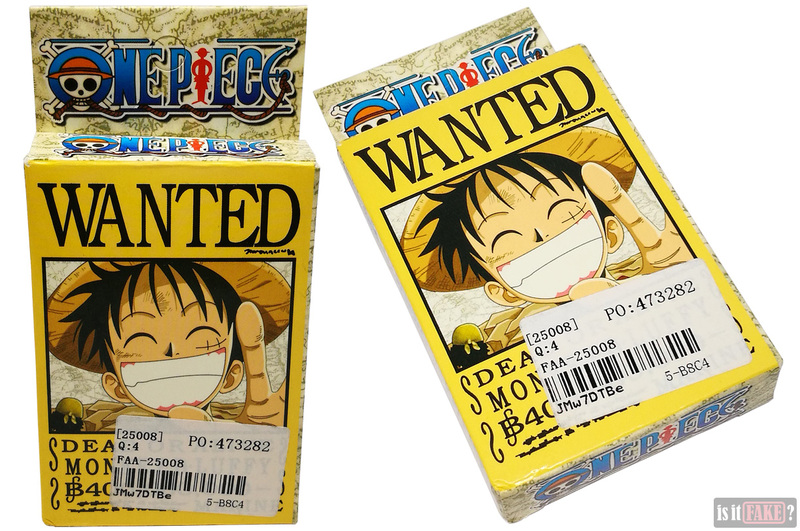 We see the official series logo on all sides of the box, while on its front and back are Luffy and Chopper bounties. These bounties were featured in the anime and have even been turned into actual posters by various companies. What’s odd about the pictures is how yellow they are. Luffy is lacking his usual skin tones, and Chopper his brown fur – not to mention both images look dull with their flat colors. 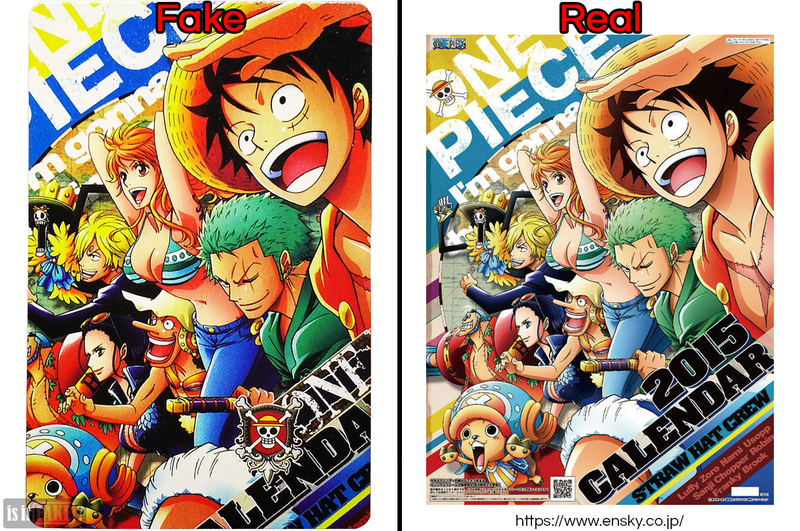 Compare these to official products, such as the Luffy posters found here and here, and the Chopper poster here, which are far more colorful and artistically rendered. On the front of the box, we see a sticker with a barcode. 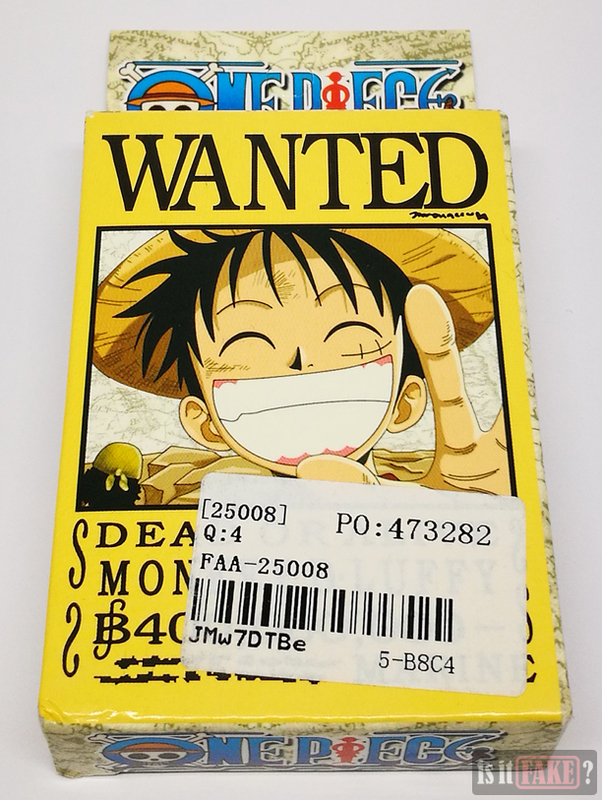 When scanned, this barcode doesn’t lead to any information even remotely connected to One Piece. 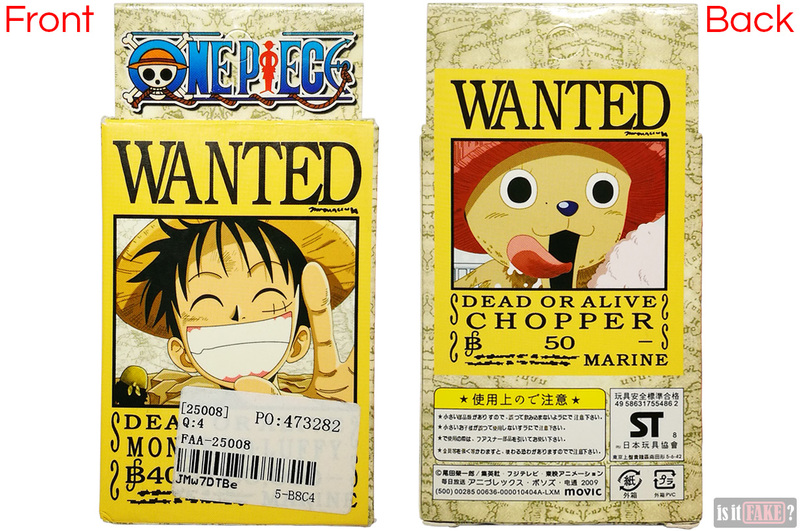 On the back, below the image of Chopper, we see a lot of information in Japanese. 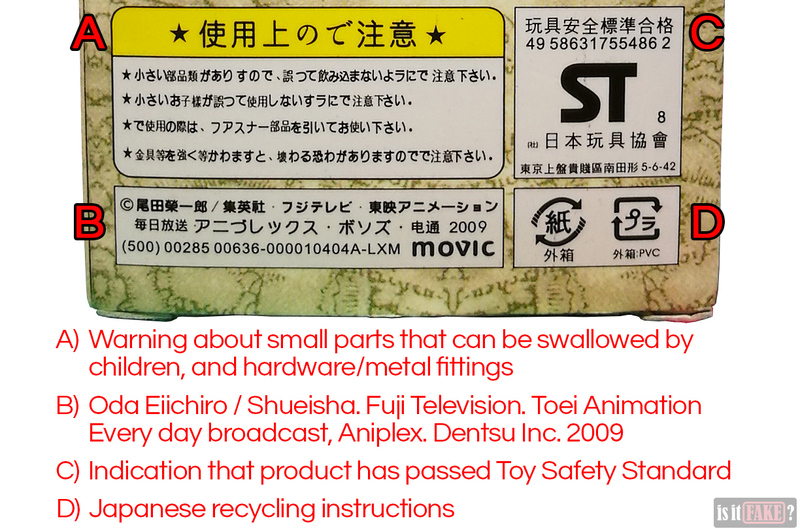 Most of this information looks legit, such as Japan Toy Association’s Toy Safety Standard sign and the Japanese recycling symbols. 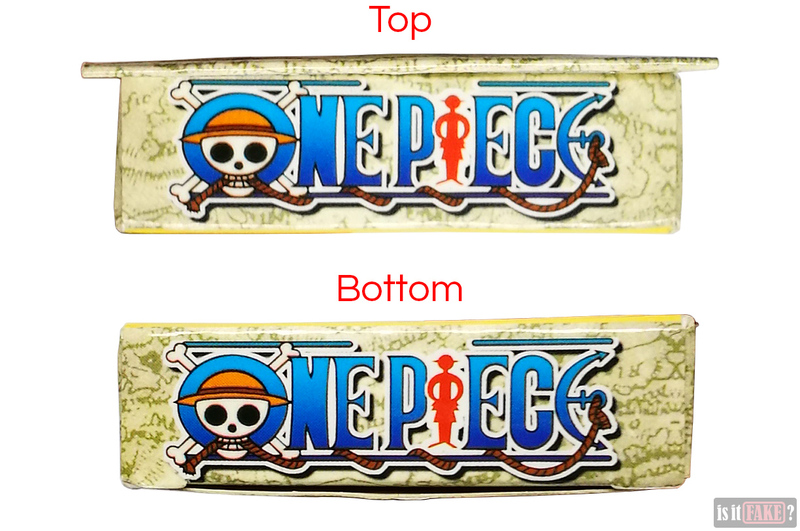 There’s even a portion on the lower left (section B in the image) that names the author (Oda Eiichiro) and publisher (Shueisha) of the One Piece manga, identifies the anime’s animation studio (Toei Animation) and the network (Fuji Television) that airs the show, and other organizations related to the franchise. And of course, we get Movic’s logo. It all seems legit, doesn’t it? When you examine section A, however, things get a little fishy. While cards can indeed be swallowed by children, this deck doesn’t come with any sort of “fittings” that can harm anyone. This section reads more like a warning you’d find on the packaging of a toy, not a deck of cards. It’s possible it was copied from another product’s packaging. Of course, the box designer was banking on the buyer not knowing how to read Japanese. 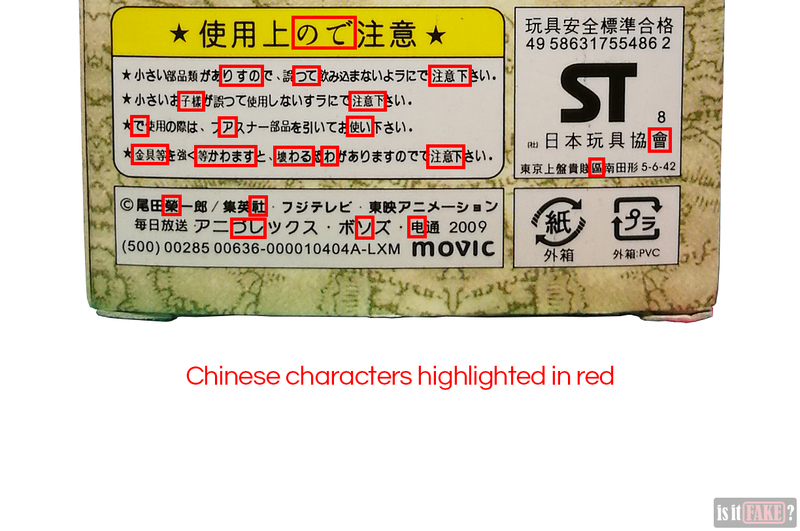 And if you can read Japanese and Chinese, you’ll notice the character fonts used are a combination of both languages. This is highly unusual, especially because legit products made in Japan wouldn’t come in packaging mixing the two languages in a single sentence, much less entire blocks of text. As for the cards, there are 54 of them – 13 of each suit, one Joker, and one blank card. 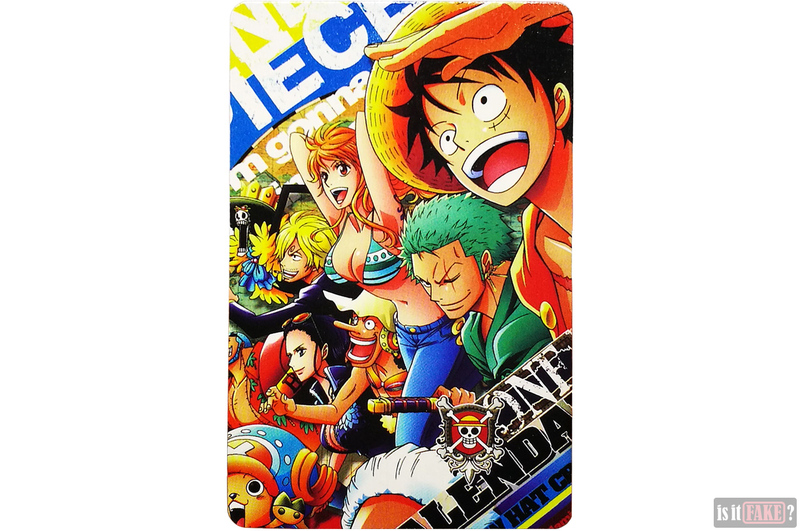 The image on the back of the fake One Piece poker cards was taken from an official One Piece calendar produced by Ensky. You can even see that a part of the word “calendar” has been cropped on the fake. Similarly, “2015” has been covered up using a non-official One Piece logo. Even more aggravating, the image on the back of the fake cards doesn’t match the one displayed on the seller’s page. So basically, you won’t be getting what you think you’re buying. 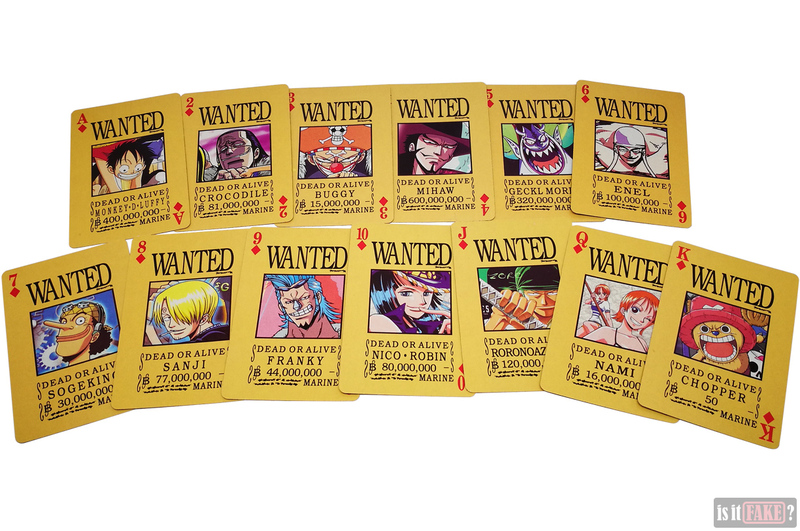 The front of the cards features various bounties that, thankfully, aren’t as yellow as the ones on the box. But here’s where things get real weird. 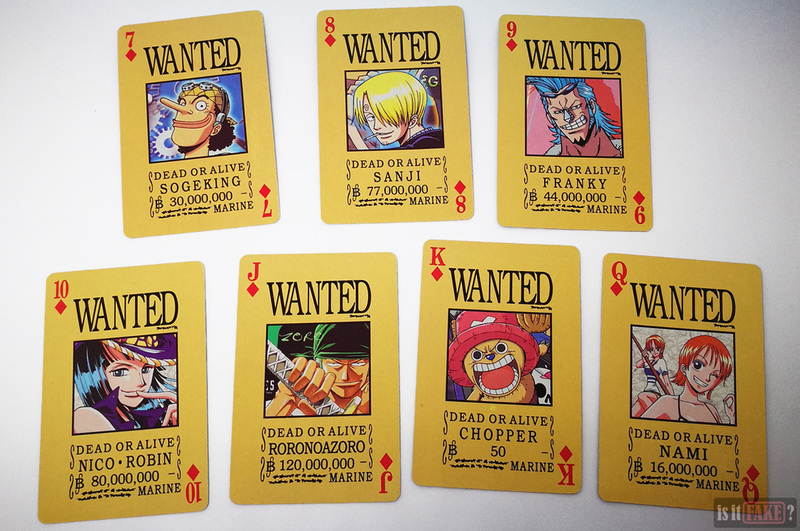 Most of the fake One Piece poker cards’ wanted posters don’t match those seen in official sources such as the anime and manga. For instance, if you look at the Ace of Spades, you’ll observe two images of Luffy merged into one. 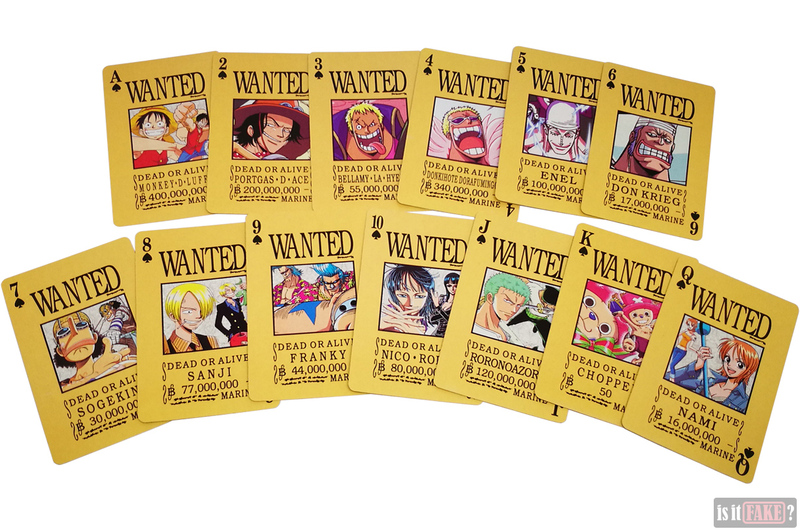 None of the official Luffy wanted posters feature him twice in one picture. You’ll see this same problem with other cards and other characters. The rest of the posters simply don’t use the right image. 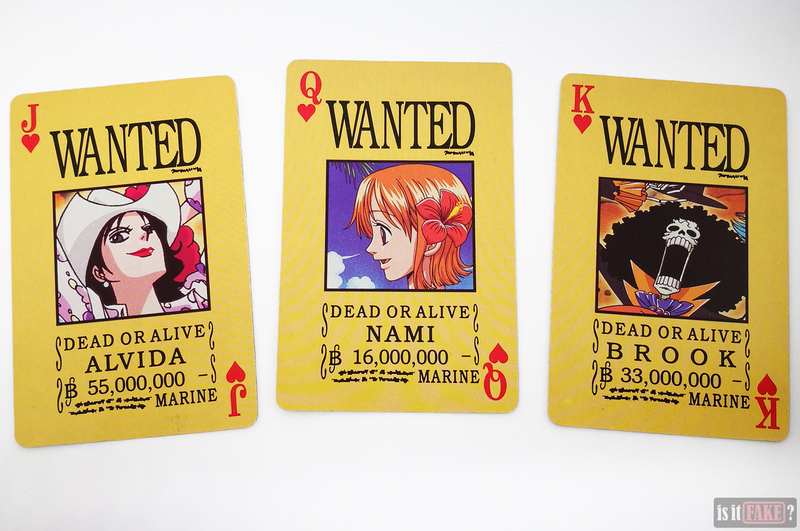 For example, in the image below, the Jack, Queen, and King of Hearts all use the wrong images of Alvida, Nami, and Brook respectively. 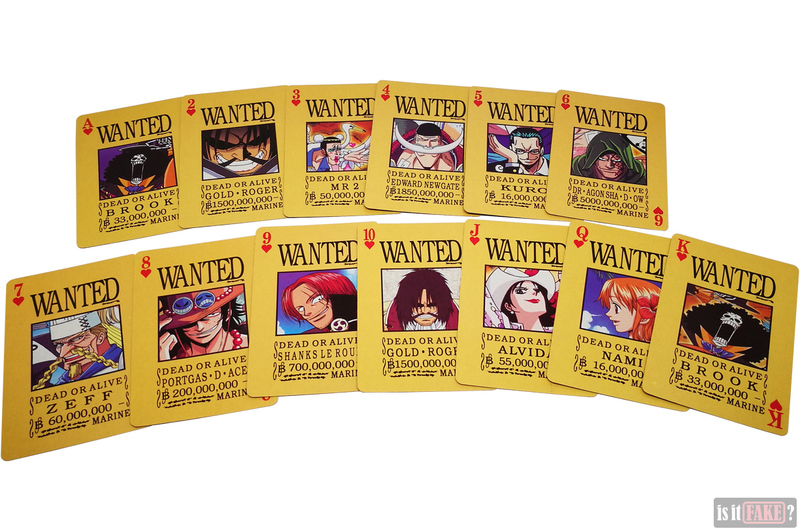 For comparison, check out the official wanted posters here. There’s also no rhyme or reason concerning which characters are used for which card. 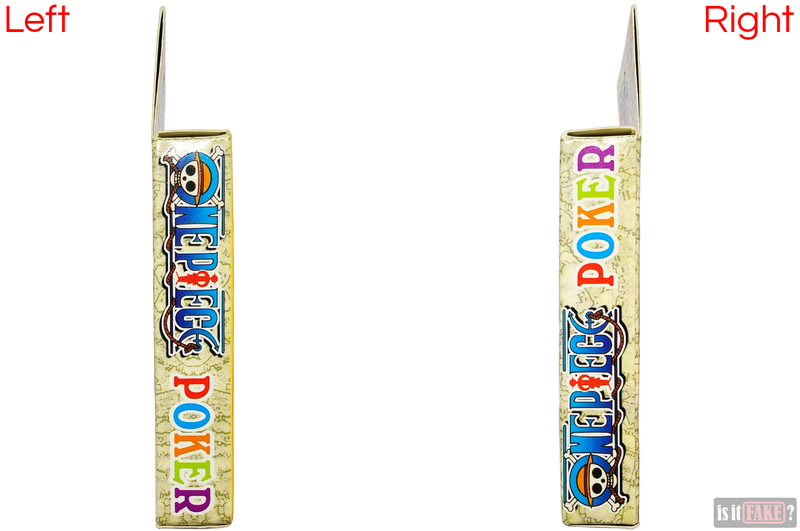 For example, the Ace of Hearts is Brook. So why is Brook also the King of Hearts? As for the physical condition of the cards, they’re far from pristine. The edges and corners are frayed, so much so that some of the white cardboard underneath the colored ink is already noticeable. Speaking of ink, the print quality of the illustrations is nothing to write home about. The sharpness of the color and line art are inconsistent because the pictures were taken from various sources. The general design itself is plain and boring. 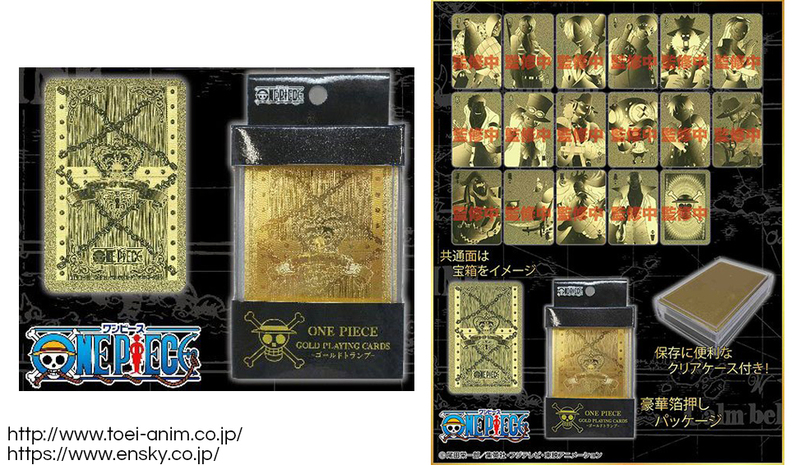 If these are supposed to look like the One Piece wanted posters, the area around each image would’ve benefited from a parchment-like texture. 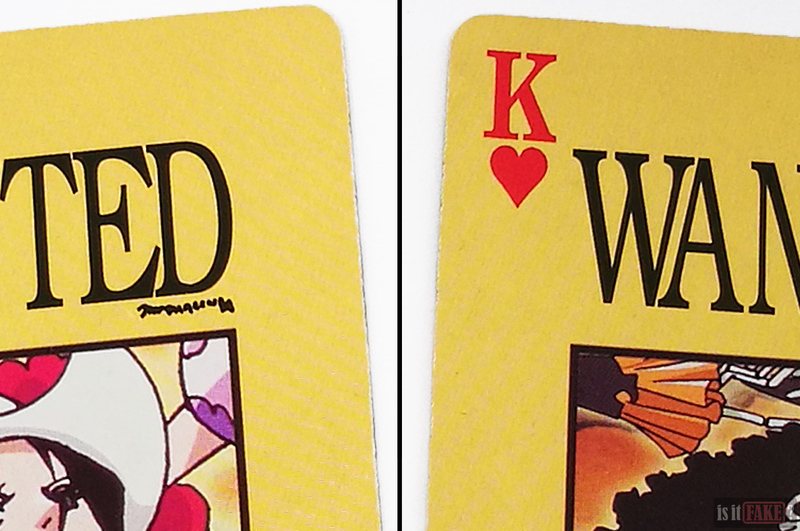 Official playing cards are rarely that expensive, so why buy a fake deck? 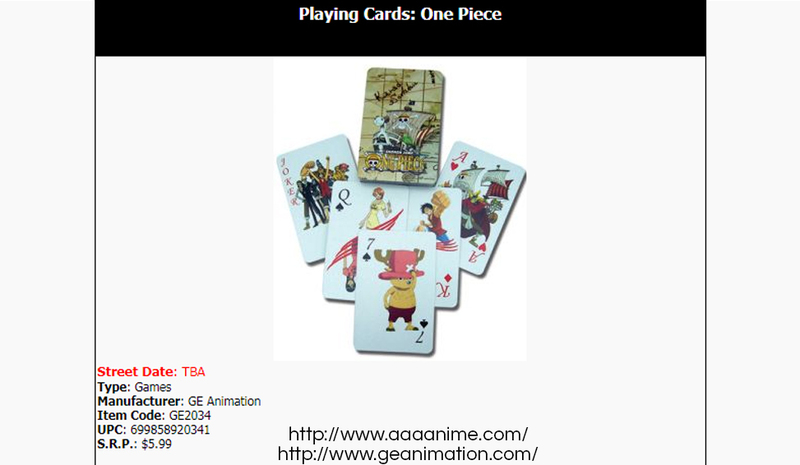 Over the years, a number of companies have created One Piece playing cards. You’ll even find some of them still listed on online stores such as AmiAmi. Unfortunately, many of the older ones are no longer in stock in most shops, such as this beautiful deck of gold cards from Japanese manufacturer Ensky. But you’re in luck. 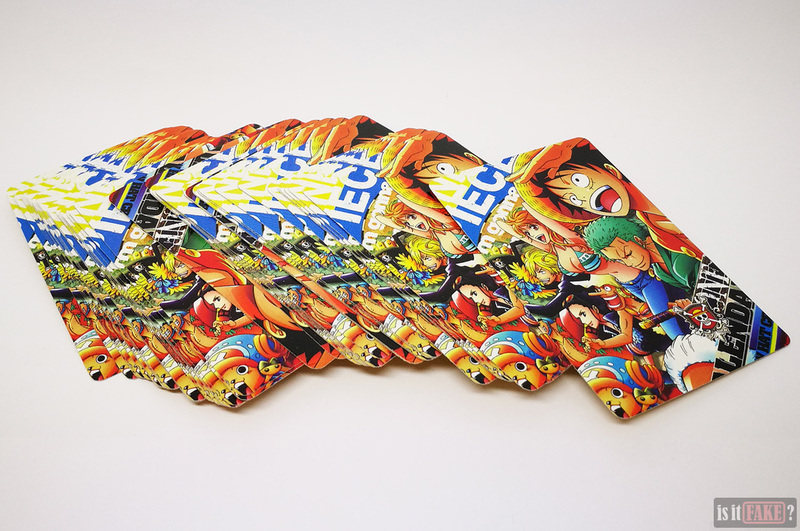 This specific deck is for sale on Amazon Japan for a mere $11. Just make sure you have a translator app (such as Google Translate) to convert all that Japanese to English. 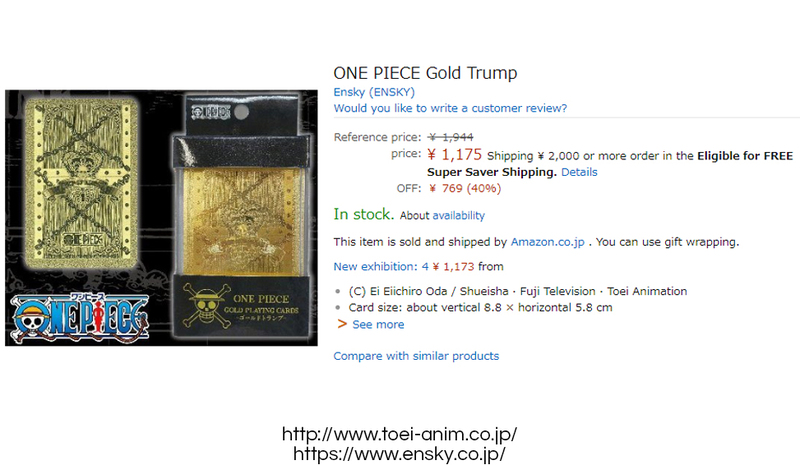 The gold cards are also available at the Toei Animation online shop, but you can only access the store link if you live in Japan. If you’re looking for something a little cheaper, Great Eastern Animation has at least three types of decks for you. You can find all three on AAA Anime, each one costing $6. 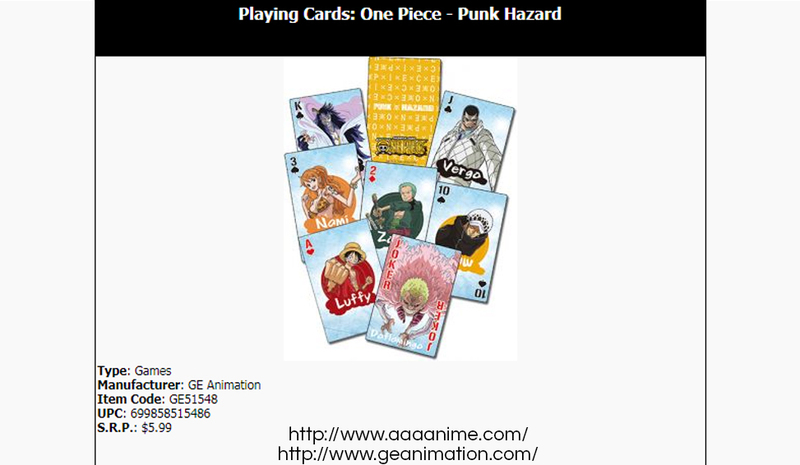 The same three decks are also available for $6 on Right Stuf Anime. 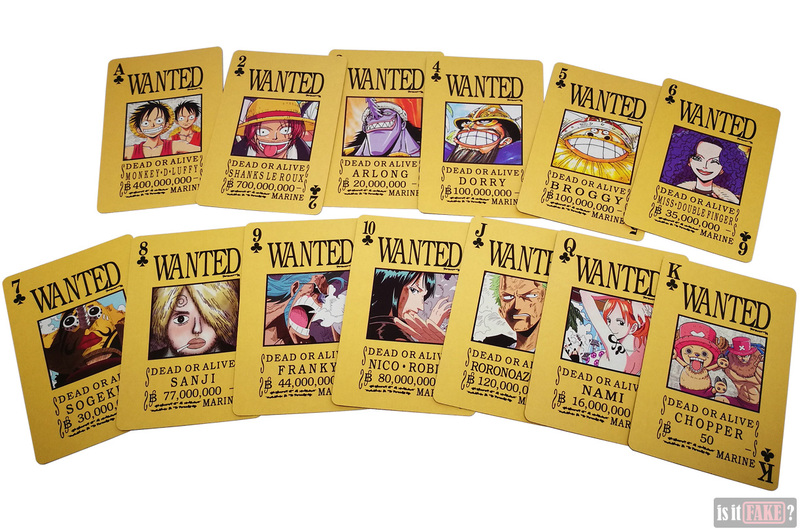 There’s not much to like about this deck of fake One Piece poker cards. 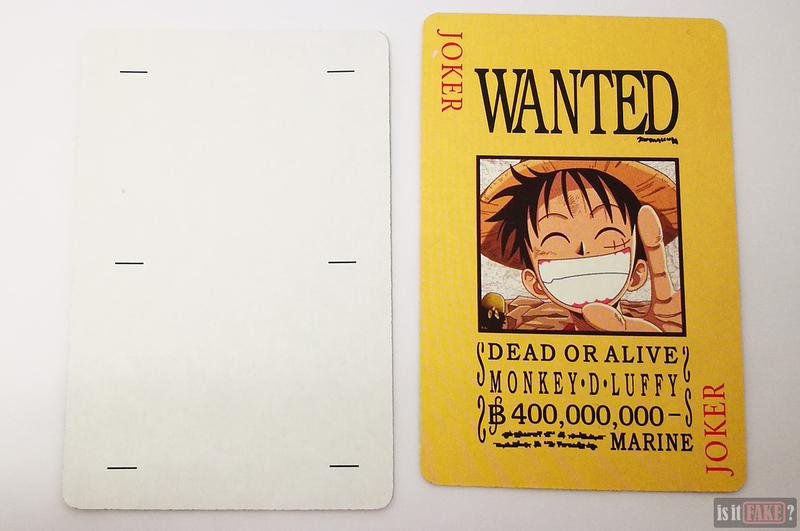 The general design of the cards is boring, and they don’t even get the whole “wanted posters” motif right. Let’s not forget these cards are also in rather poor condition. If we’re going to be honest with ourselves, we can’t give this bootleg any lower than a 70% terrible rating.